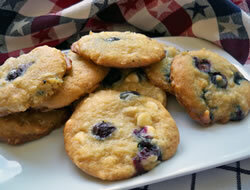 If you like a hearty cookie with a lot of texture, this cookie is for you! 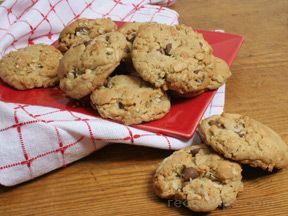 Dense with oatmeal, rice crispies and coconut plus the added flavor of chocolate chips; this cookie is perfect to pack up and take on the go. Add eggs one at a time until each is incorporated. Add vanilla and water and beat until light and fluffy. Sift together the flour, baking soda, baking powder and salt. Slowly add this to the batter until combined. Mix in the coconut, oatmeal and rice crispies. You may need to use a wooden spoon for this part instead of a mixer because the dough becomes somewhat stiff. 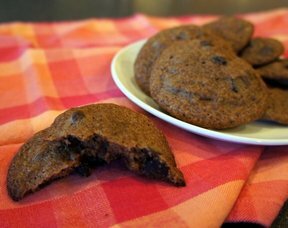 Using a medium (approximatley 2 teaspoon) cookie scoop, drop batter onto prepared cookie sheets and bake in a preheated oven for approximately 10 minutes or until the edges are nicely browned. Remove to a cooling rack. Store in an air tight container. 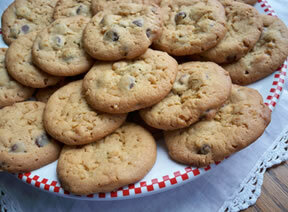 "Nice biscuits, good texture next time will add cinnamon. Defiantly make again."